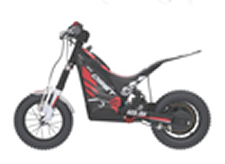 Competition Wheels & Cycles inc.
OSET is the World Leader in the design and manufacture of electric motorcycles. The range of OSET bikes is ever expanding, with four bikes currently available - catering to riders from 2-12, and beyond! OSETs are proven in competitions, taking multiple National level victories against petrol powered machines. OSETs are now recognised globally as the best learner bikes for children. Remember - OSETs are electric and SILENT, so the riders can learn in the back yard after school every day! 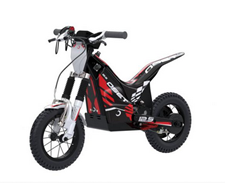 OSET electric dirt bikes have been on the market globally since 2006, and have transformed the learning process for young riders completely. Amazingly, riders as young as 2 years 6 months are riding OSETs on two wheels, and even standing up on the pegs. This clearly puts OSET riders YEARS ahead. While electric motors are not powerful enough to effectively haul full sized adults on serious off-road terrain, they are more than powerful enough for Children. Oset has been very careful to select components that are very high grade, and can do the job required to a very high standard. The beauty of electric power is that it is completely clean, linear, and virtually silent. 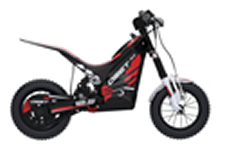 At the same time, Oset bikes will outrun a lot of 50cc bikes on acceleration, and will out-torque them on the hills. With small children riding, OSETs can run on a single battery pack for over 2 hours of normal stop-start riding. Even when the batteries are drained, they can be switched to a backup pack in about a minute! OSETs have a unique design that emphasizes quality and safety. Each bike has a fully adjustable speed dial, so the bikes can be dialed in by the responsible adult anywhere from zero to full speed. OSETs have real working suspension, set for children's weights. Everything is adjustable, from the speed, to the suspension, to the handlebar position. These bikes can be carried upside down in your car. Competition Wheels and Cycles, Inc.